In the modern age of architecture, the severe geometry and monotony of even the holiest of places renders most buildings of worship only notable to us because of God’s ubiquity. But we are human and often need that sensory nudge from the material world to evoke a palpable communion with Him — stained glass that dyes light like at Sainte Chapelle in France, finished in 1248; the gilded and honeycomb woodcut of the mihrab in the Umayyad Mosque in Damascus, directing worshippers in the direction of the Kaaba in Mecca, built in 715; the blue dome that tops the Tempio Maggiore Synagogue of Florence, seen punctuating the skyline as guidance, completed in 1904. These buildings are artifacts of a past that allowed beauty to guide design. These buildings are sacred places for their function but also for their rarity. Notre Dame de Paris was a relic for its time, and ours — it is one of the most resplendent contributions to mankind by man himself, in the French Gothic style, unlike anything even of its own day. Completed in 1345, the building faced the violent irreverence of the French Revolution but survived, a feat considering France itself was changed forever. It was called a “liber pauperum” meaning “poor people’s book,” because its intricate facade sculptures told the stories of the Bible for the illiterate. Despite its grandeur, it was a public good — transcendence was inclusive and available for all who walked through its doors. 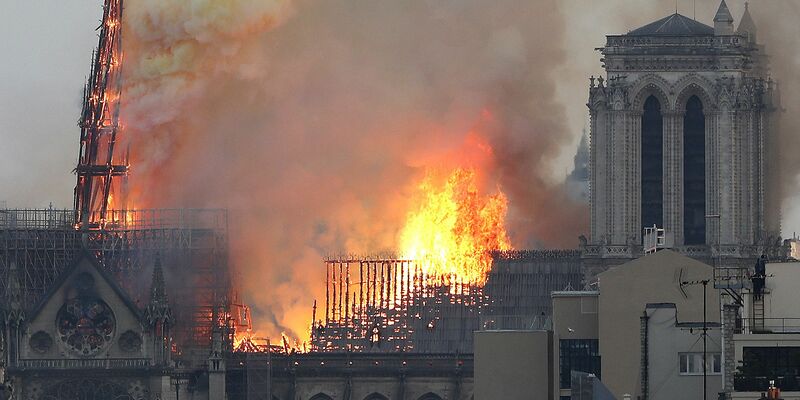 If the firefighters could have captured the tears of the French, and people everywhere, the fire would have be extinguished long before it was.